Why is Ireland now bowing to the EU? 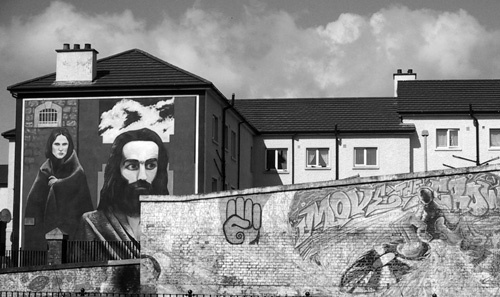 It is 25 years since the northern Ireland Hunger Strikes ended, on 3 October 1981. This anniversary is a good time to reflect upon the many changes that have taken place in the politics of Ireland since then. The Hunger Strike, begun when Bobby Sands MP first refused food on 1 March, saw 10 Republican prisoners starve themselves to death in support of their demand for the reintroduction of political status and the five rights associated with it: the right of prisoners to wear their civilian clothes at all times; the right to free association within a block of cells; the right not to do prison work; the right to educational and recreational facilities; and the restoration of lost remission of sentence. The rights disappeared when the prison authorities, at the behest of the Thatcher government, attempted to impose a criminal regime on the prisoners in denial of the political nature of their struggle against 800 years of British oppression and exploitation. At the time it seemed that the sacrifice of the ten young men, Bobby Sands MP (26), Francis Hughes (25), Raymond McCreesh (24), Patsy O'Hara (23), Joe MacDonnell (30), Martin Hurson (29), Keven Lynch (25), Kieran Doherty (25, and a member of the Dáil), Thomas McElwee (23) and Michael Devine (27), and the international support that grew up behind them, would prevail and change utterly the relationship between Britain and Ireland – which had been used for so long to oppress British workers as much as Irish ones. In the elections that followed in northern Ireland in 1983 Sinn Fein obtained 13.4 per cent of the votes cast without really trying and seemed set to consolidate this success in a new phase of the struggle. But 25 years on and eight years from the signing of the Good Friday Agreement the picture seems somewhat different. Back from fresh talks in rather grand surroundings in St Andrews where Robert the Bruce held his first Parliament, the political parties continue their will they/won't they dance. Meanwhile industry disappears and services continue to decline as Peter Hain, the Gauleiter of the north, practises his acceptance speech as Labour's Deputy Leader in waiting. Nothing much was to have been expected of Ian Paisley's Democratic Unionist Party, whose vocabulary of No continues to reverberate through the halls of political dialogue. But Sinn Fein with its legacy of the struggle of those young men 25 years ago should have achieved some sort of progress to show that they had not sacrificed their lives in vain. For Sinn Fein, however, political progress in northern Ireland is only a sideshow. Their main aim is to break through their 8 per cent ceiling in elections to be held in the Irish Republic in 2007, and to do that all they have to do is show that, whoever is to blame for the current situation in northern Ireland, it is not them. Only by appearing moderate can they access the consensus that is the most significant change in Irish politics in the 25 years since the end of the Hunger Strike. In the Irish Republic no one talks about nationalism or republicanism anymore except as a totem, as an excuse for a few drinks on a Friday evening when the Guinness flows and the songs of Irish freedom give rise to maudlin tears and a hangover the next day. Eight centuries of struggle against British imperialism give way without a fight to meet the demands of the European Union and ever more power to Brussels. Even the vote against the Nice Treaty, so shocking to the political class in Dublin at the time, was quickly reversed once the abortion question was resolved and another referendum rapidly organised. It is all very well to ask what the people want, but quite another for them to be listened to when they come up with the 'wrong' answer. In essence there is no real opposition to the European Union in Ireland as long as the money flows to the corporate sector and the ruling class can get ever richer on the spoils from the big men's table. The debate on the European Union in Ireland is long overdue. What it means for a country, what it means to be independent, how the working class can regain control of its own future. It is a debate that needs to take place on both sides of the border at the same time, for the outcome will affect everyone equally whether republican or unionist, protestant or catholic. Surely, as we remember the ten young men who died so that they could wear their own clothes in a British prison, it is a debate worth having.